Prep for your ethical hacking certification exams for just $69. It's not enough to know the material-you need to know how to take the test, too. If you're ready to launch your career in ethical hacking, we've got a bundle that help making acing five certification exams a breeze. Get the Ethical Hacker Professional Certification Package for $69 at Escapist Deals. This training usually goes for $1,499, so make sure you grab it while it's available at a huge discount. You'll get 60 hours of training that'll get you ready to pass five professional hacker exams and become a Certified Ethical Hacker, Computer Hacking Forensics Investigator, Certified Information Security Manager, Certified Information Systems Auditor, or Certified Information Systems Security Professional. Learn how to bypass wireless network security, master the tools that ethical hackers use every day, and learn best practices for your industry. You'll get a full year of access to all of the material. 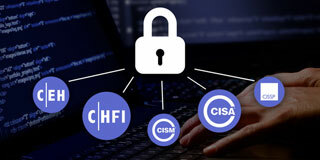 Get the Ethical Hacker Professional Certification Package for $69 at Escapist Deals.